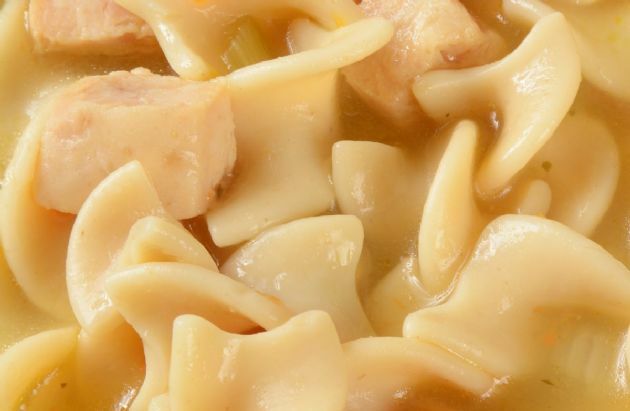 Nothing beats a bowl of fresh, homemade chicken noodle soup. Nothing beats a bowl of fresh, homemade chicken noodle soup. 1. In a medium saucepan, bring water to a boil. Add noodles and oil, and boil 8 minutes. Drain and rinse under cool running water, then drain again. 2. In a large saucepan, bring broth, and poultry season to a boil. Stir in celery and onion. Reduce heat, cover, and simmer for 15 minutes. 3. In separate bowl, mix cornstarch and water together until cornstarch is completely dissolved, and gradually add to soup, stirring constantly. 4. Add noodles and chicken, and heat through. Add salt (optional) to taste.